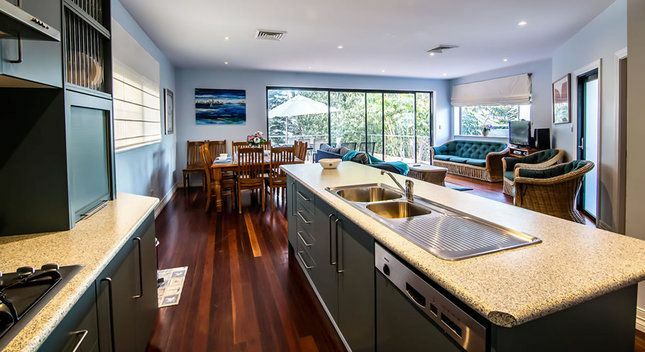 Situated in the heart of Avoca Beach, next to the shops and great restaurants, 50 meters walk to an excellent surfing beach, which can be seen from the lounge and main deck. Decks offers luxury accommodation for up to 10 people in a huge 290 square meter 4 bedroom apartment. The open plan kitchen dining/living opens onto a private deck with BBQ and outdoor dining setting for 10. There is a second living space and 2 other decks to provide personal space for all guests. 1 minute level walk from the beach, Decks at Avoca is set back from the street offering very private accommodation for up to 10 people. Deck's is just 1 hours drive north of Sydney. Off street undercover parking is provided for 1 vehicle. Great surfing at one of NSW's best knows beaches. Also while staying at Deck's there is a Theatre, Tennis, fine Dining and Deep Sea Fishing nearby. Diving and Snorkelling are available not far away. 4 Bedroom luxury accommodation. Accommodates up to 10 guests. 2 Queen beds, 1 Double Bed, 4 single beds (2 sets of bunks). Great location in the heart of Avoca Beach! Flat walk to Beach, Cafes, Restaurants, shops, Tennis Courts, Sail Boarding, Kayaks and paddle boats on Avoca Lagoon, 'Avoca Theatre' and parks. A small supermarket and bottleshop are conveniently located within sight of the front drive and Erina Fair is just a 15 minute drive for all your shopping needs. Great location and spacious unit. Amazing place right on the beach, perfect for a weekend away! Fantastic place, so close to everything. Beautiful views, great location, clean, everything we needed and more. THANK YOU ! We had a great weekend here. Clean, spacious, great location, well equipped. Location was great. Walking distance to beach and shops. Apartment is huge, clean and well equipped. Derek was very helpful.